Anything cooked in a cast iron skillet is bound to be good; you as a foodie know this. Potatoes at any stage, method, or level make the perfect side dish…you know this as well. So why not combine the two? Please don't take this little ol recipe of mine as coming up with something new… most of us have had cast iron potatoes in one form or another, but the ridiculous ease of these potatoes and….. the texture and flavor you get from them is wonderfully amazing. Creamy Yukon gold potatoes starting out frying in a layer of oil and seasoning, then transitioning to a cooking combination of steaming and pan roasting, brings out the buttery-nutty goodness of these earthly gems. You’re left with the crispy texture of the outside and the light sweet fluffiness of the inside. When these cast iron potatoes are around, I go back for seconds and thirds. Surprisingly, I rarely go back for seconds and thirds of anything. Unless it is brownies or some kinds of gravies. Pan gravy is great over these potatoes too. Okay, I’m done. Bring out the cast iron skillet. A well seasoned cast iron pan should be a part of any serious home cook’s kitchen. Searing meats, pan frying or roasting , some stewing…. you need a cast iron pan. Treat it well and with love. Look for basically the same sized potatoes. All the potatoes will be cut in half to help with cooking, but it’s how we arrange then in the pan that will give some sort of unity is size. For the larger potatoes cut in half… these will be lain flat side down in the pan. For the “about right” size potatoes cut in half lengthwise but keep together when laid down in the oil. So you’ll have larger potatoes cut in half and fried flat side down, then the others cut in half and kept together, lain down resembling whole potatoes. In your cast iron pan (or skillet) begin heating around 1/4” to 1/2” of the oil depending on the size of your pan and the amount of potatoes you’re doing along with a pat of butter. The oil is great for higher temp cooking but has no flavor… the added butter gives added flavor. Add a tablespoon or a good healthy pinch of the Cook’s Line Seasoning (or your regular S&P) to the oil. When the oil begins to “shimmer” from the heat begin laying down the larger (flat side down) potatoes. They will sizzle and pop… that’s good! In between those snuggle in andlay the “about-right” cut potatoes. Fry the potatoes on moderately high heat just until you start smelling the nutty caramelization of “fried potatoes”. Lift up one of the flat side down potatoes to see if it is a nice golden brown. If so start giving all the spuds a turn on the other side. Cover the pan and let the potatoes steam/roast in the pan on a low yet steady heat. Just long enough where they are knife tender (a knife slides in easily). Remove from the heat when done. Add extra seasoning on top and maybe chopped parsley for color (if at this point you are about to eat your face off from smelling the cooking of the delicate creatures, and don't give a damn about “color” from parsley, then by all means please skip this step.) Keep warm in the pan if the other parts of your meal are not complete…. or you just forgot to cook them. Serve up as a side dish, make pan gravy to cover the top, or just eat right out the pan. You’re welcome. A wonderful side dish...especially with "smothered" pork chops. I love having garlic confit readily available in my kitchen. It’s perfect spread on grilled baguette, toasted focaccia, and warm ciabatta. Added to pasta dishes, salads and soups and you’ll love the caramelized “roasted” flavor of the sweet buttery garlic. Typically the Garlic Confit will last in an air tight container in your fridge about two weeks… I have only managed to keep a batch available for about three days. It is very addictive! Preheat your oven to 250 degrees Fahrenheit. Break up the head of garlic/garlic bulb into the loose cloves. Remove any loose skin/garlic paper that falls away or is loose on the individual cloves. You may peel the individual cloves or leave in their skins. I choose to leave in the skins, as I like to use my fingers and squeeze out the smooth garlic confit from each clove using the garlic casing. Place the loose cloves in an ovenproof sauce pan, or in a casserole dish. Sprinkle with a little Cook’s Line Seasoning (or plain old salt and pepper) and fresh Thyme or Rosemary to taste. Cover tightly with aluminum foil and place in the oven. Let the garlic slowly poach in the oil for approximately 2 hours or until soft and tender… and the aroma starts driving you mad. Store in it’s oil in an airtight container. Enjoy! Homemade stocks are always a great thing to have at the ready when cooking… especially around the big food holidays. Not only do you take pride and high “foodie” points for making your own, but knowing everything you put in to that stock is from your own hands. There’s no guessing about salt content, or preservatives… all natural and all you. Plus I don't need to tell you the ridiculous prices for prepared store bought stocks. So a few things to know about stock making… and this in particular is for poultry stocks. Sourcing those parts without buying the whole bird is easy. This time of year a lot of meat counters will have turkey wings, necks, and tails packaged up and ready for sale. If not ask the folks behind the counter if they have any scraps from their processing, or to reserve you some the next time they're breaking down turkeys. Just let them you need stock material and they will do the rest. So organ meat in stock? Good question. Do you know when you get the "magic bag" of heart, liver, neck and such? I’m all about the neck bone (anything attached to a bone is good stock material), but the liver, gizzard, and heart.. not so much. Different impurities and flavor will add to that stock, and that is not “good eats” in my opinion. I prefer to stick to the bone rule; meat, bone, connective tissue, cartilage, are all good stuff that breaks down after a low and slow cooking process giving you a rich and flavorful broth. Aromatics: So these are the veg, herbs, and spices you add to the stock to add another layer of flavor and hint of sweetness to your stock. Unless you’re making a stock for a specific reason or style, like for ramen or Pho, overpowering the “source” flavor with aromatic flavors isn't necessary. A basic mirepoix (meer-pwah), Onions and/or Leeks, Carrots, and Celery, is the rule of thumb for stocks. Sweetness from the carrots and onion, with a little bitter balance from the celery. I also add garlic cloves for a light hint of garlic flavor… compliments most flavors that come out of my kitchen. On top of the mirepoix flavors we add a bouquet garni , or a tied bunch of herbs added to the pot for flavor, and removed after cooking. There isn’t one specific “recipe” but always always always with Bay Leaf, Parsley and Thyme. I also add Sage when I’m making turkey stock, and Rosemary when making chicken stock... Whole black pepper corns too! Now I’ve seen chicken stock recipes that call for one or two whole cloves, citrus peel, or chili pepper. Again, I like to keep my poultry stocks “meat” flavor forward and not over power it with added spices. Time and Temp: Always start your stocks out in cold water, not hot! The idea isn't to get the pot boiling quickly to extract flavors. The reason for cold water is that cold water penetrates the bones… it starts working it’s way through the porous material extracting flavor. And you’ve heard me say many times when cooking proteins…”Low and Slow”. Lower temps for longer periods of time gently breaks down connective tissue, cartilage, fats, bone material, adding to that great collective of gelatinous goodness and flavor in your stock. A really great stock will take most of the day to cook. Seriously. Once cooled, and depending on the flavor source materials, you should end up with a cold container of turky gelatin. That is how you know you did everything correctly. Alright… so on to the stock. Preheat the oven to 450 degrees. Now I like a darker turkey stock , so we are going to roast the source parts and the veg. Roasting everything caramelizes the natural sugars in the meat and the mirepoix bringing out sweetness and richer flavor along with the darker color. Place the turkey parts, mirepoix, and garlic in a large roasting pan. Drizzle with a little grapeseed oil or light olive oil, and roast about 25-30 minutes, carefully tossing everything around with tongs to really get a nice caramelization on all side of the ingredients. Remove from the pan and dump everything (any juices and fat too) into a large 6-8 quart stock pot. Place the roasting pan on the stove and turn up the heat. Allow the bottom bits to sizzle and crisp, then add water (some use wine if you want that flavor in your stock) to deglaze the pan, scraping up all the good bits. Pour the fond into the pot with everything else. Cover the goods in your pot with cold water…enough to cover the top. Have any extra water in a boiling kettle to add to the pot (this time hot water is ok) to top off the stock from evaporation. Add the tied bundle of herbs, bouquet garni, to the pot and bring to a boil. Once it starts boiling bring the temp down to just barley a simmer. Slow and Low! Cover and let the stock do it’s thing for the next six hours. Yes, six. Every fifteen minutes for the first three times, skim the scum that floats to the top. These are impurities and not good eats. Check it every thirty minutes or so after that for scum… and add the hot water when needed to keep all the goods covered in water. After six hours remove (very carefully) the pot from the heat. Set up a colander over another large container , and dump the contents inside. Toss out the bones, veg and herbs. Rinse and wipe out the main pot, then grab another strainer and line it with cheesecloth (or use a fine mesh hand strainer) and place that on top of the main pot. Again, pour the contents from the second pot, through the second strainer, and in to the main pot. You gave your stock another straining for a relatively clear stock. Pour your strained stock in to heat proof/food proof containers with lids. Let them cool down completely before placing in the fridge and cover. Keep what you like in the fridge and you may freeze what is left and use another time. Friends and I traveled east to Tulsa Saturday night, where we tried out a new restaurant called Torero Bar & Kitchen newly opened by one of their cousins. Fantastic Spanish and latin America inspired food, and fantastic menu and wine/drink list. Their dessert menu, though…. on point! “Peel the label off the can (or cans!) of sweetened condensed milk, place it in a pot or large saucepan, and cover it with water by 1 to 2 inches. Bring it to a very gentle boil, then reduce the heat to LOW, so that the water has a nice slow simmer. I like making my own dulce de leche but understand it takes a few hours. Dulce de Leche may be purchased pre made. NOTE: Solid cans (without tab lids) are preferred. ***VERY IMPORTANT: Watch the water level and add water if the level of water falls below the top of the cans. Very important to keep a watch on the water level! After the simmering time, turn off the heat and allow the cans to come to room temperature. ***IMPORTANT: Do not open the cans while they are still hot! Let them cool completely before opening. Place the flour, almond meal, cornstarch, baking powder and soda in a bowl and mix to combine. Set aside. 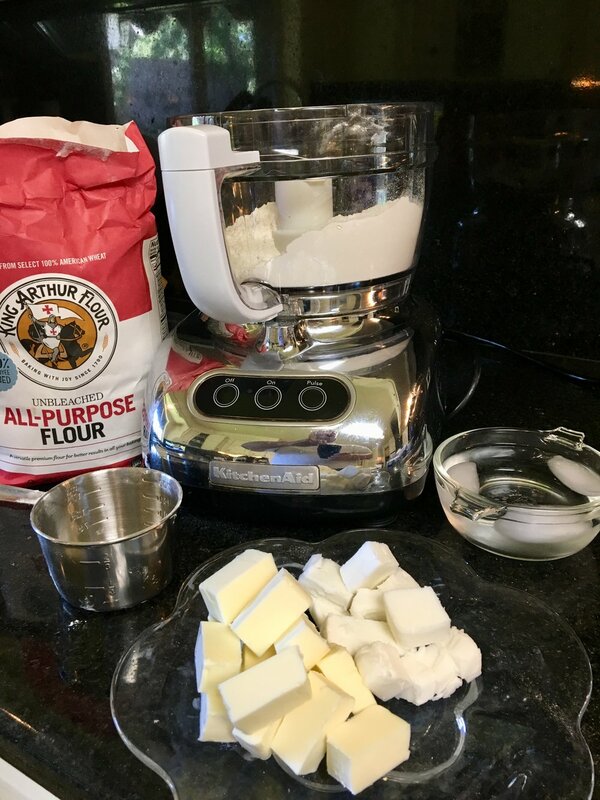 In a mixing bowl with paddle, cream the butter along with your sugar. Mix until smooth and light (like my love). Add the room temp egg yolks one at a time and mix until combined evenly. Add the almond flavoring and vanilla and mix. Gradually add in the mixed dry ingredients in stages. Add and mix until combined then add more and repeat. When all the dry had been added and you have a nice firm dough that has come together. Ball up, flatten to a disk shape, wrap in plastic, and chill for an hour. When you’re ready to bake, preheat your oven to 350 degrees. Line a sheet pan/cookie pan with parchment or a sil-pat, and set aside. Lightly flour a surface and place your unwrapped cookie dough on top. Roll out the dough evenly to about 1/4” thickness. Don’t sweat the dough cracking.. it happens. Just pinch-patch back together. Stamp out round cookies, 2” fluted or larger. I did a combination of both. Just remember you’re making a sandwich cookie, so two cut-outs per cookie. 2” cutter should yield around 24, so one dozen cookies. Lay the cut cookies on your sheet pan and place in the oven. Bake approximately 12-14 minutes. The cookies should be lightly golden on the edges and bottom, and still light on top. Remove from the oven and cool completely. I found it easier to have the “dulce” in a pastry bag with tip, in order to squeeze out filling onto the cookie. You can also just spoon a portion of the dulce on the cookie. Spoon or pipe out a walnut sized portion of the dulce. Top with another cookie and gently press down and evenly "smoosh" the filling to the edges. Complete all the cookies so. Dust the tops generously with powdered sugar, and have at it. Enjoy! Ugh, it’s still summer and I’m cooking like it’s Fall. But you know what? that’s okay... because last night I had a taste for Sweet Potato fries. So yeah, I love the sweet potato fries... and I like different kind of sweet potatoes for my sweet potato fries. Being that it is still summer, I mean big time summer here in Oklahoma, pickin’s are a little slim in local markets for sweet potato varieties. Still good enough are my two favorite, the standard sweet potato, and the Japanese “boniato” variety. Both make a good french fry, but the trick is YOU need to have good knife skills! Cutting fries isn’t the easiest thing right off the bat. It takes patience and practice. Sweet potatoes, and especially boniato, are a little tougher to cut. So make sure your cutting board is secure, you have a good sharp (I mean sharp not “cuttable”) knife, and those little fingers of yours are curled in. When figuring the amount of potatoes to use, I figure one small/medium sweet potato per person. Also, I have a little trick, and you can use it, or you can toss it it’s up to you: I toss my fries with a little corn starch BEFORE tossing them with oil and seasonings. The cornstarch gives a little “crispiness” to the fry when baking. Also ONE pan at a time in the oven if you’re feeding a big crowd. Yes, I know you can get at least two in your oven, but when these babies are cooking they’ll put off some steam. The more pans of potatoes in the oven the more steam there is. Thus soggy limp fries. wash, peel and cut your fries. Not too thick, and not to thin... about 1/4” wide. Make sure they are all the same length as well. Trim when needed. Place in a bowl and toss with a couple shakes of cornstarch. Just enough to dust them lightly. If a savory fry is more your speed sprinkle with “COOK’S LINE” seasoning of course, or sea salt and black pepper. The options are endless with seasonings, so have fun with it. It's my dirty little secret. Toss everything together, and lay out on to a lined (parchment or Silpat) cookie sheet. Make sure there’s space between each fry. If your sheet pans are smaller and can’t fit all the fries, break them up into two pans. *read two pan rule above*. Bake 10-12 minutes until a little browned, remove the pan and flip the freis over, and bake again another 10 minutes. Ovens vary, so keep an eye on them. Once they’re cooked and ready, serve them up however your creative little mind sees fit. Just make sure you have a side or drizzle of DIRTY LITTLE SECRET sauce. Not just because I make the stuff, but seriously... Dirty Little Secret with sweet potato fries (or any french fry) is amazing! I never really used ketchup before..... now I REALLY do not use ketchup for anything anymore. Including my fries. Earlier this week I made saffron risotto from Carnaroli rice a friend of mine in Italy had sent me...knowing I love risotto. As usual...I made too much. That's what happens when you cook all day for a living and come home starving...maybe a glass or two of wine was involved as well. Anyway, so there was leftover risotto. Now what's a good use for leftover risotto besides cold from the fridge at 2:00am? ARANCINI of course! Fried risotto balls with cheese (typically mozzarella) melted perfectly in the center. They make a perfect snack, and you didn't waste the risotto. 2. My steps (and breaking steps vary) : roll in beaten egg, then in flour, back to egg, then completely coat in the bread crumbs. Set aside. 3. Begin heating your olive oil in a deep pan... About 365/370 degrees F.
4. After your Arancini have all been cheesed, balled, and breaded, carefully begin deep frying in the oil. Fry until golden brown, and drain on paper towels or rack. 5. Serve as soon as you can with a little marinara or your favorite *dipping sauce, and snack at your leisure. *I mix and heat equal parts of marinara and In The Kitchen With Scotty's "Chile Pepper and Lime" sauce.... Amazing. 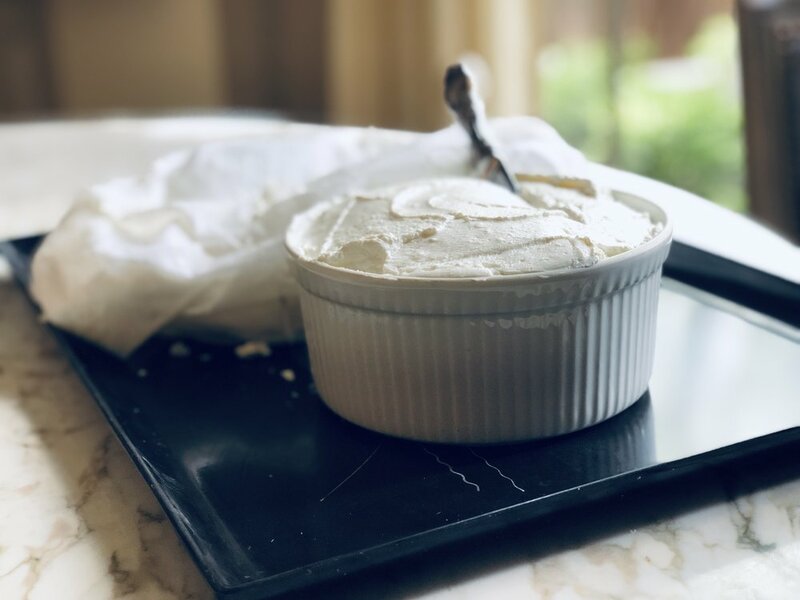 I love crème fraîche; I love using it in recipes and as a condiment, and bored of “substituting” sour cream in it’s place. Later on today I will be making a plum cake (more to come on that) using creme fraîche, but before I started on that I needed to knock out a batch of my homemade crème fraîche. Don’t grocery stores carry crème fraîche? Well here in Oklahoma City…sometimes. I always seem to run across it when I’m not needing it. It really isn’t convenient to shop at my local grocery stores, namely because not a lot of people use to on a regular bases. Isn’t sour cream an acceptable substitute? Yeah…. but it’s sour cream. Flavor and texture wise, crème fraîche is it’s own delectable creature. In a non metal container (I used a spent and clean jar of Magoo’s Sloppy Joe sauce *wink wink*) pour in the heavy cream and buttermilk. Cover tightly and shake well to combine. Loosely cover the container and let it set out on your countertop for 24 hours. The science behind this: there is a good bacteria in buttermilk (also in yogurt) called “lactobacillus” which ferments the lactose in the cream. Bacteria needs warmth, moisture and food to grow. Warmth you get from the room temp, moisture you get from the air and contents, food you get from the sugar or lactose in the cream. After 24 hours you will see a nice thickened cream. Transfer to a clean tightly sealed container, and refrigerate. ; use as needed. Shelf life is two weeks. I was working with boiler onions today. They're great in soups and stews, kabobs, or sprinkled with a little sugar and caramelized in a pan with butter or bacon drippings. Add to roasted or grilled meats, and vegetables. Two comments along the lines of "I don't use them because they're too much work with (or don't know how) or to peel them"
1. Trim or snip off the root end. Some say both, but for presentation purposes I just do the root end. You're left with the "tip" (pointy part) when peeled. 2. Add to salted water and bring to a boil....about two minutes. 4. Squeeze out the perfectly peeled onion into a bowl. Voila! So, before you toss out that finished jar of pickles… go ahead and save the juice. 1. In a large sauté pan melt 3 tablespoons of butter along with 2 tablespoons olive oil. Add a few whole sprigs of fresh thyme and fry gently; Really flavor your butter mixture with the thyme as the butter browns slightly. 2. In one pound batches (so you’ll repeat this process two more times… three total) begin to brown your mushrooms. Lay flat, barley touching, and cook. Sprinkle with a good pinch of Cook’s Line Seasoning, and then flip the mushrooms. 3. Gently splash with a third of your pickle juice. You’ll notice the “sauce” will thicken a bit. This is the acid coagulating with the milk proteins in the butter.. sort of a “beurre blanc” effect for all you food nerds. Let this sauce dissipate, and really coat your mushrooms. Adds a nice concentrated flavor. 4. Repeat the process two more times in the same pan. Watch your heat as to not burn your pan, smoke up the kitchen, and give your last two batches a bitter burnt flavor. Wipe out the pan if necessary, otherwise keep on going! 5. Serve as a side dish with roast chicken, or on top of grilled meats. I grabbed a fork and sat down with a glass of “spicey” Cab Franc. Enjoy!! Pour all the liquids and salt into a heavy sauce pan, and bring to a gentle simmer. Line a fine mesh strainer with cheese cloth, and prop over a deep bowl. When the milk mixture comes to a simmer, it will start to “break”.. the curds separating from the whey (Hey, Miss Muffet). Stir only once (resist the temptation to stir) , and Just let it do it’s thing. You’ll get a better yield. Remove the sauce pan from the heat, and carefully pour the entire contents through the cheesecloth and mesh strainer. Just let it drip… the longer it drips, the firmer your ricotta cheese will be. 6. When it’s your perfect consistency, and cooled down, use in your favorite recipe. Baking, stuffed pasta shells, lasagna, or even a bowl with honey pure over it. Amazing on fresh toasted artisan bread by the way. 7. 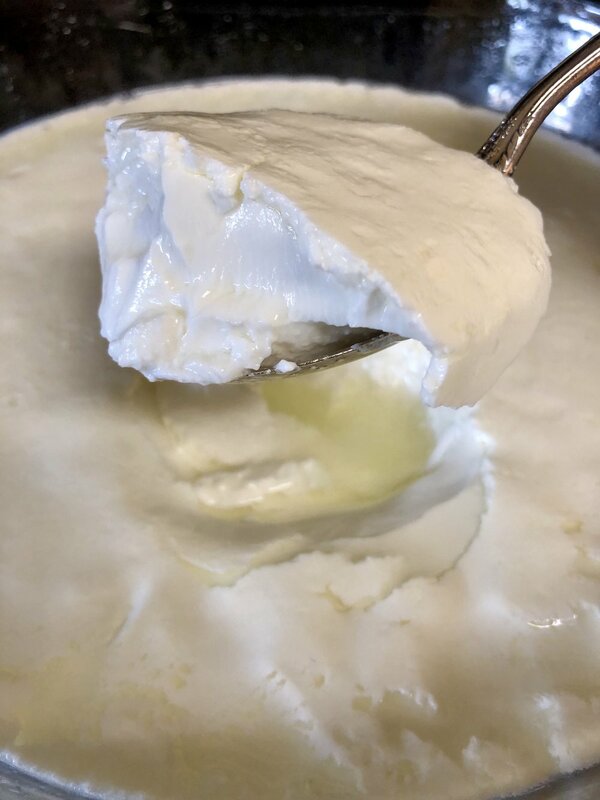 In a tightly sealed container, your ricotta will last around three days in the refrigerator. Someone recently asked me what I thought about the "cauliflower pizza crust" idea. I think it's a great alternative for those wanting/needing an alternative to a traditional pizza crust...and more importantly, it's delicious. Parents, this is also a great and creative way to get some veggies into your children. Good luck with that. 1 large head Cauliflower, wash and trimmed. 1. Steam your head of cauliflower in your favorite steamer. Don't boil.. adds too much moisture.. steam it. 2. Remove the florets, and run through your food processor. Add the garlic clove, oregano and salt. Pulse as smoothly as possible. There will still be small chunks, and thats okay. 4. Form your crust on a parchment lined cookie sheet.. I drew two circles, for mini pizzas, on one side of parchment, turned it over, and formed my crust with offset metal spat. Keeping my crust about 1/4" thick. 5. Bake 375 degrees about 45 minutes.. some may go an hour depending on size of cauliflower and oven. 6. Remove the pizza crust from the oven.. let cool a bit, and start adding your sauce and toppings. Return to the oven to cook the toppings. Cut and serve as you would traditional pizza. Crust will not be as chewy and firm as a bread crust but pretty darn close. Look at you eating cauliflower and stuff.